Mary Green continues her series on trees in the Celtic calendar. The spring snowdrops came early in January, celandines came in February, ducks were mating on the canal and the lone barnacle goose suddenly re-appeared. I still don’t know where this goose comes from – they are winter visitors to western Scotland and Ireland – but it comes back here for a time every winter. Candlemas Day on February 2 (also known as Groundhog Day and Imbolc) was “fair and bright”, though cold. According to tradition, this means “winter will have another flight”, and sure enough it did. The Alvechurch Wassail on the day after brought well-needed warmth to a cold wet night. My tree for this month, the one that appears in the Celtic Calendar for this time of year, is the alder. It is very common around here, yet people rarely notice it or even recognise it. But it was obviously important enough at one time to name one of the months of the year and a letter of the alphabet. It represents the balance between male and female elements in nature, unlike the willow which was perceived as female. Alder, or Fearn in the Celtic languages, was associated with the great hero Bran, and was said to be powerful in battle and sometimes the king of trees. But it also had a link with water and the goddess Brigid, giving it healing and comforting “female” qualities. In Greek, Norse and Italian traditions as well as Celtic ones it is especially associated with spring, its new green leaves marking the coming of spring proper. These leaves were thought to have healing properties and were sometimes worn in shoes on long journeys to protect the feet. Like willow, alder grows by and even in water. It needs wet or boggy ground and won’t survive well if it dries out. Here it grows along the canal in many places. It can survive in wet and poor soil because it has a special relationship with specific bacteria which allow it to fix nitrogen. Spare nitrogen and phosphorus can collect around the roots of a mature tree, and it shares these with other alder trees, helping them to grow, and also with lichen, fungi and insects, some of which are specific to the alder. It needs plenty of light for seedlings to grow, so is a plant of open country, waterside and forest edges. It is a “pioneer tree”, taking over new ground and allowing other trees to establish later, when it dies down. There is an interesting stretch from Withybed to Alvechurch which has alders on the field side, with ash, holly, hazel, willow and other trees on the towpath side. The towpath side was cut along an old hedge: some of the trees probably pre-dated the canal and the hedge-bottom flowers are those of old woodland. The side with the alders, however, would have been cut through a field and the trees came later, on to open ground. In other places they sprout out of the canalside water by the towpath, from where they are often trimmed to stop them growing into trees. You can also find alders along the river Arrow and by Bittell reservoirs. Alders, because of their habits, are very water-resistant. So, the wood used to be used for canal piling, wharves and bridges. The world-famous Rialto Bridge in Venice is built on huge alder piles. Early boats were often made from alder wood. Where an alder has been cut along the canal, you can easily spot it. The wood is white when first cut but soon turns orange when exposed to the air. This added to the magic of the tree, which was thought to bleed like human beings. Two key uses for alder were for making clogs and gunpowder. They are perfect for clogs which will be worn to walk through wet and mud. I can remember wearing trendy clogs in the 1970s and wonder if they were alder wood. It was the charcoal from alder that was used for gunpowder, and the trees were often grown near gunpowder factories – I guess this might have been the case in Birmingham. This is especially apt as the ancient Celts used alder charcoal to forge metal for their weapons for hunting. The wood was also popular for brush handles and other tools. So, it was one of the trees encouraged in the outer parts of the many woodlands planted round here in the past by the Harris brush company, such as Shortwood. It is relatively quick growing but more robust than willow, so it lives a bit longer. However, alders don’t grow to real old age like oaks and beeches. Alder is a catkin-bearing tree like hazel and birch. It has far more prominent female flowers, though. These are like small green pine-cones, turning brown later in the year as they ripen. The dangling male catkins are a bit like hazel but a lovely reddish-purple colour. As these become covered with pollen, the female cones open their scales and receive the wind-blown pollen. There are no insects involved. Having prominent male and female flowers on the same tree may be one reason for the mythological status of this tree as balancing male and female. Alder was a dye-plant. The female flowers were used to make green dye, associated with the fairies, foresters and outlaws! The bark makes a red dye, possibly used anciently as a face paint, and the twigs brown. Alders are attractively-shaped trees, quite tall, with dark green rather leathery leaves. They are particularly good to see in the late winter and early spring when they glow red with catkins: the bare trees have lovely shapes. The roots are often partly exposed by subsidence in the banks and they help to hold the banks together. Geese love to nest among these roots: a pair of Canada geese returns to nest under an alder in Withybed every year. One of the other Celtic trees, not representing a month, is the aspen, related to the black poplar and white poplar. Aspen is more common in cooler places and grows well in the uplands and in Scotland and Ireland. All the poplars are catkin-bearing trees and like damp or wet ground, like the alder and willow. The aspen differs from the other poplars by having male and female catkins on the same tree, like alder. This makes it more successful at spreading by seed. It is also a great sucker-producer and colonises large stretches of land this way. The defining characteristic of the aspen is the way the leaves shake in the wind. They are delicate leaves on very fine stalks, and the least breeze sets them off chattering and rustling. I wrote about black poplar a few years ago when our mighty tree fell in The Meadows here in Alvechurch. There are still some there and elsewhere round here, though getting rarer each year. White poplars (also known as abeles) are very similar in tree-shape and leaf-shape, but the back of the leaf has a distinctive fine white down, so as the wind blows the tree looks silvery-white. The trunk has diamond-shaped dark marks on its light-coloured bark. There are some lovely ones around Tardebigge, and a line planted alongside the footpath south of Foxhill near Alvechurch. You will also see Lombardy poplars around here. These are the tall narrow ones, not native but often planted distinctively on ridge-lines and to mark boundaries. 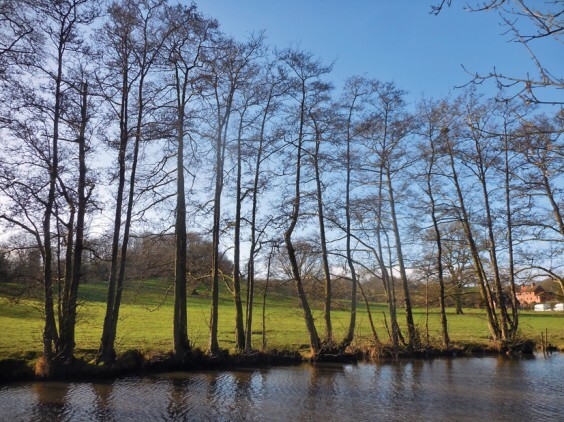 We are lucky around here to have sufficient wet areas to host all these water-loving trees, with the two-hundred-year-old canal greatly enhancing this as farm land has been drained. I wrote this poem in March a couple of years ago. Of Parma violet, sweetening the mouth. Sings an air of love and longing for home.